This section shows the third course of the family dinner - le dessert . You will be able to reply when asked to choose what flavours of ice cream you want - whether in a café or in a family setting. The section draws together what you now know about food and drink, and suggests more projects, including making real French-style dairy icecream. 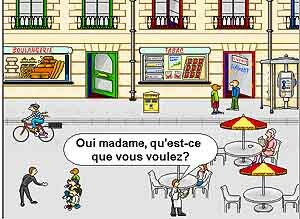 You cam also use your growing command of French to tell a simple stories.. The Teacher's manual offers suggestions for possible plots and writing frames within the scope of your current vocabulary. RIGHT: "I like ice cream,", filmed outside Hesdin Town Hall. LEFT: waitress service in a seafront ice cream parlour. RIGHT: eating an ice-cream cone. The Teacher's Manual suggests a project making your own French-style ice cream as an activity conducted in French. If you want ideas for new flavours, search the Internet for ice cream recipes, starting here. Chapter 2.12 in the Teacher's Manual suggests a project making achildren's picture story book - with pop-ups or "lift the flap" to keep the reader involved. You can use simple, easy-to-use multimedia authoring packages for an even better effect , likes "Story Maker 2"
Monkey's hungry, but he can't find his banana. Some fearsome jungle creatures offer him tasty alternatives, but monkey isn't convinced of their generosity. A nice story told with lively illustrations.